Orange Beach, AL -2BR/2BA * Silver Beach 803* Directly on th Beach, Top Floor, Best view! Fresh new look! This 8th floor Silver Beach condo has everything you need for a great vacation or getaway! Wake up to the ocean view from the newly decorated master bedroom which features a king size bed and flat screen TV. This bedroom faces the gulf and has its own patio door to take you directly out onto the balcony. The Master bath has a full tub/shower and the guest bath has a large walk in shower. The second bedroom has fresh new decor, a newer full size bed, newer flat screen tv and ceiling fan for additional comfort. More views of the ocean and beach from the cheery living room which has a queen size sleeper sofa and a new Smart flat screen TV and DVD player. 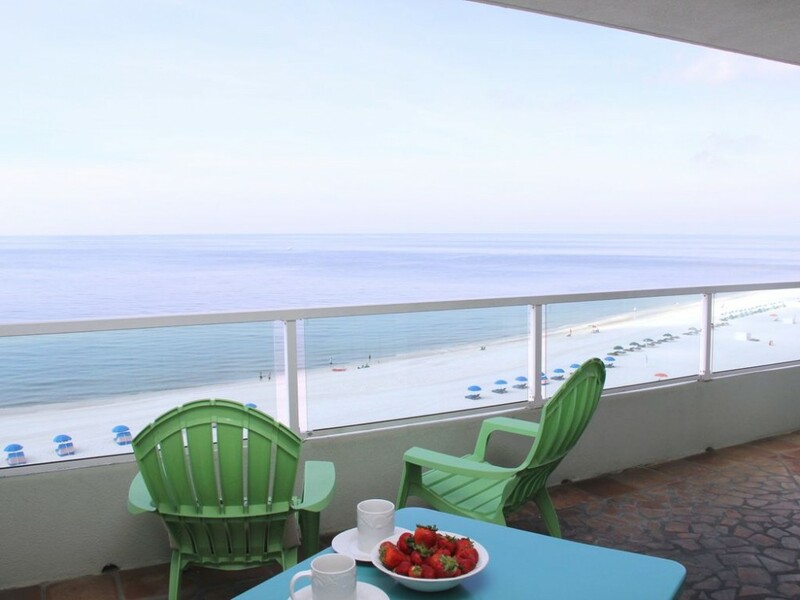 Take in the unobstructed panoramic views of the gulf or dolphin watch from this top floor balcony, which is also tiled and has plenty of seating and a new bright, cheery table and chairs. The covered balcony is a great place to eat, relax and enjoy the gulf breeze. The full kitchen with bar features granite counter-tops and is fully equipped for your stay. It includes a large refrigerator, microwave and dishwasher. A full size washer and dryer plus plenty of storage are just off the kitchen. Use the complimentary password protected WiFi to stay connected to family and friends. Cable TV is also included at no additional charge. The white sand beach is just steps away and easily accessible, or take advantage of the large Silver Beach pool on ground level. There's plenty of room to explore, swim and relax! A community room with bathrooms is accessible from the pool area, providing an additional area to gather and take in views of the beach. Over sixteen restaurants are nearby along with a variety of shopping and services for all your needs. An ATM is located directly across the street. Weekly rentals are Saturday - Saturday only, no exceptions. Direct payments accepted . Will consider a small dog - unit is pet friendly (prior approval required). Please mention you would like to bring your dog when requesting information and provide age, weight and breed. 100% refund if canceled at least 30 days before arrival date. No refunds for cancellations less than 30 days prior to stay. Must be 25 or older to rent, maximum 6 people in unit. Weekly rentals only, Saturday - Saturday. Deposit and signed rental agreement required to make reservation. This condo is located in central Orange Beach. It is just as nice as the pictures shown and was very clean. Ms. Brenda contacted us within an hour of arrival to ensure everything was ok and if we needed anything. We loved being right on the beach and sitting on the balcony. It is conveniently located close to Walmart, Winn Dixie and Publix for any items needed. We will definitely be repeat customers to this condo for our beach trips. This was our second stay. We thoroughly enjoy this condo and all Orange Beach has to offer. Brenda and Steve are excellent hosts, and we love that we can bring our Chihuahuas with us. I would highly recommend this property! Spent one week at Silver Beach. What a great week! This home away from home is simply perfect. When we walked through the front door you could see the ocean. The view is incredible! If we weren't on the beach, eating at tasty restaurants or adventure seeking, we were planted on that large balcony with a glass of wine in our hands listening to the surf. This place is decorated in a tasteful beach theme that insures you feel on vacation. Loved it here and we are planning two weeks next year! My family of 4 just spent two weeks in this little gem and were COMPLETELY SATISFIED! Everything we needed was available in the unit from cooking utensils to beach toys. It was our first trip with the family pet and she absolutely loved having free range of the unit without fear of accidents. As many know, our pets are a part of the family! Conveniently located to restaurants, groceries and golf courses. Traffic is manageable and the beach wasn't crowed at all. Not even on the 4th! We've been traveling to the Gulf for 22 years and this was without a doubt the BEST VIEW EVER! We saw more dolphins in two weeks than in the previous 10 years combined! Even jumpers! Brenda was very helpful and checked on us throughout the visit to insure our enjoyment. We HIGHLY RECOMMEND this owner and unit and WE WILL BE BACK! You can't ask for a better view or location. This condo is very clean, well-stocked and pet-friendly to boot. Our family of three just loved this little beach condo. It will sleep 6, but I would think this might be a bit cramped. Three or 4 is just right. Many businesses are conveniently located just across the street. No need to fight traffic. A stop light gives pedestrian access with no problem. The spring break crowd was pretty respectful and they did not over-crowd the beach. Brenda is so responsive to email, and even called us to make sure everything was in order once we checked in. We hope to rent again. Thanks, Brenda! Perfect vacation. Condo is right on the beach. And there is very simple access into the condo, and from condo to beach. Loved the balcony for watching the sunrise and sunsets, and getting some sun during the day. Condo was spotlessly clean, very comfortable, with really cute beachy decor. Owners were extremely attentive to our needs and went out of their way to make sure we were comfortable and had everything we needed. Definitely will be coming back here!! Had a wonderful vacation. Couldn't have asked for more. Very clean condo, very nice and festiv decor, perfect location and its pet friendly! We could walk to restaurants and shopping! The easiest check in I have ever experienced. Just walk up to the door and punch in the code. So smart and simple. And no one had to keep up with who had a key when we left separate or went to the beach. This condo made vacation easy and fun. Will go back to this same unit in the future for sure! The owners called and checked on us as we arrived and we had open communication the whole trip. Such nice people and they really care about your stay! They even sent a thank you card and surprise with our deposit check! No regrets or disappointments here. And the people in orange beach are so friendly. It was a very easy and fun trip. Can't wait to go back. I'm missing it so bad!!! My wife and I stayed at here for 8 days. So relaxing. Very comfortable king-sized bed. Great view of the beach. Well stocked kitchen. Everything was very nice and comfortable. There were even treats for our dog. Owner contacted us to be sure that everything was in order and if we needed anything. We've already made our reservations here for 2 visits in 2016. The condo was very cute and had everything that we needed for our wonderful week's stay. There was a great view from the balcony, and also from the large window in the living room and the master bedroom. There are a couple of grocery stores across the street from the condo and plenty of nice restaurants in the area. We especially enjoyed eating lunch at Lu Lu's and also at The Boardwalk restaurant. It was also great to be able to bring our little dog with us. There is a designated area for the dogs to walk at the condo and also several dog parks close by. The owners were very nice and helpful. We had a few special request and the owner helped us out with them. She is flexible and understanding. The condo is as advertised and the view is awesome. I talked to several other condo owners and the property is extremely safe. Great for kids! 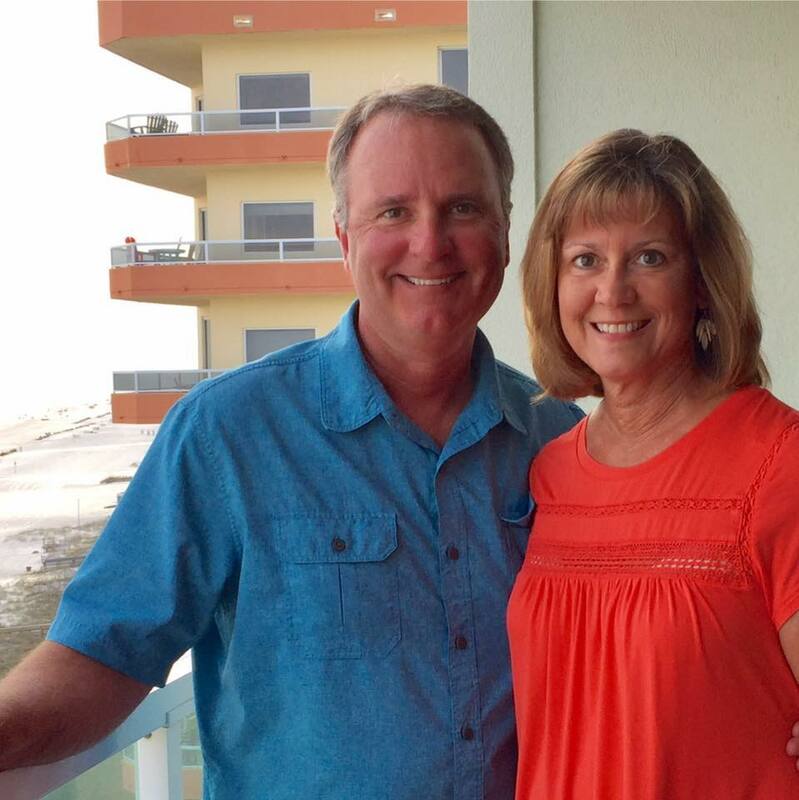 Gulf Shores is an up and coming beach area and every restaurant we went to was awesome. I will rent this condo again when I plan my next trip to Gulf Shores.